Architectural publishers are a hyperactive bunchha reflection of the audience they serve, no question. with mountains of books signaling the arrival of a new season, we decided it was time to sort out the best. The turmoil surrounding the redevelopment of the World Trade Center might seem unprecedented but Meredith Clausen reminds us that we’ve been here before. The history of the Pan Am Building at Park Avenue and 45th Street is as contentious as that of any building in Manhattan, involving celebrity architects, power-brokering, even death at the blade of a helicopter. This biography of a landmark proves to be a cautionary tale. Each book in this brand new collection of pocket-sized pamphlets is meant to be read in the time it takes to drink your morning coffee. At $1.49 each, they also cost less than the average lattt. But the content of the miniature volumes is weightier than might be expected: Each BBK contains an essay, short story, picture portfolio, or biography, some old and some new. Texts range from Jonathan Swift’s 18th-century satire A Modest Proposal to Los Angeles Times critic Christopher Knight’s essay on the planningof the Washington mall, The Mall in Peril. The Museum of Modern Art’s return to Manhattan left its temporary quarters in Queens nearly forgotten. This book recalls the journey organized in June 2002 by Belgian-born, Mexico-based artist Francis Alls designed to commemorate the original move to the outer borough. The procession, in which 200 participants shouldering replicas of some of MoMA’s best known workssand artist Kiki Smithhmarched from West 53rd Street to Long Island City, is documented in images, text, and film. Mark Linder looks at the cross-pollination of ideas between minimalist artists and architects in the late 1960s. Examining writing by figures like Colin Rowe and Robert Smithson as well as the work of more recent architects like John Hejduk and Frank Gehry, Linder claims that, contrary to conventional wisdom, architecture preceded art in the development of the formal language of minimalism. Brooklynites can be noisy in their preference for their borough, but this compendium of work by resident artists and designers of every stripe shows that there is plenty to boast about. The Architect’s Newspaper‘s own art director Martin Perrin imposes order on the diverse and unruly nature of the work by organizing it by zip code, and intersperses descriptions of each artist and his or her work with photographs of the rooftops, streetscapes, train tracks, and waterfront that inspire it. >Record picturess was the name given to the photographic accounts of civil engineering projects in the 19th century, and artist Michael Collins has gathered a series of these extraordinary images into a book of the same name. While the photographs of railways, bridges, and power stations have specific documentary concerns, one can see them as precursors to the precise typological studies of Bernd and Hilla Becher and the many students who emerged from their influential Dusseldorf school. This catalogue for an exhibition of the same name, held in 2003 at the International Center for Urbansim, Architecture, and Landscape in Brussels and organized by Jean-Francois Lejeune, tries to get at the contradictions in Latin American cities like Quito, Lima, and Mexico City by looking to their roots. From the overlay of the 1573 Law of the Indies on ancient Aztec cities to Le Corbusier’s pleasure in Brazil’s vibrant public sphere, the essays included in this book immerse readers in the complex development of urbanism in Latin America. Sigfried Kracauer’s writings on cities have never been as well known as his film work, but reward a look. In this slim but dense book, Henrik Freeh analyzes the early essays and autobiographical novel of the architect turned social theorist and critic. He shows that, for Kracauer, ornament was not merely a pleasantly decorative addition to buildings and streets but central to the way each of us understands cities. Freeh’s own photographs illustrate his text. If you only know Nikolaus Pevsner’s 1936 book from one of its later black-and-white paperback Penguin editions, this new larger format book will come as a revelation. Pevsner was an early champion of modernism and contended that it was the only true and appropriate style for contemporary architecture. While theorists like Manfredo Tafuri and others have shown his argument to be oversimplified and limited, this new Yale edition supports Pevsner’s stance with luscious color photography that makes it easy to understand why he believed a new world order was on the horizon. Call it the triumph of hope over experience. Architectural publishers continue to put out glossy modern house books promoting better, smarter ways of living, even as McMansion subdivisions metastasize the world’s remaining open spaces. Yes, it’s true: American-style tract houses are being as enthusiastically consumed by the rest of the world as Kentucky Fried Chicken and Britney Spears. If there is good news, it’s that the modern housee has also gone global. Modern House Three by New York writer Raul A. Barreneche and The New Modern House by London-based Will Jones show us residential architecture that’s stylishly international in its concerns and referencesssomething Philip Johnson could never have imagined. Tellingly, two of the most intriguing examples featured in Modern House Three are in China. In the misty foothills of Qinlin, the Shanghai architect Ma Qing Yun has built a stately modernist box of concrete masonry and wood that reverently recalls Louis Kahn. Yet details like the local river stones set into the exterior walls and the interior of woven bamboo sheeting make this an architecture entirely of its place. in Vijfhuisen, Netherlands, designed by S333, brings together clean modern forms, simple materials (like wood panels and corrugated steel), and innovative planning. Meanwhile, in the countryside outside of Beijing and in sight of the Great Wall, Hong Kong architect Gary Chang has designed a house to serve the extraordinary vista. The striking timber-covered rectangular box, banded by large windows, is set on a tall concrete base. Inside, the main floor is a vast loftlike space with folding partition walls that can be configured in numerous ways. A hidden ladder pulls down from the ceiling for entry to the rooftop terrace, and pneumatically hinged trap doors in the floor open for access to sleeping quarters (accommodating up to 14 people), as well as a kitchen, bathrooms, storage, and a meditation chamber. Chang has radicalized the weekend house. With only a few exceptions, the 33 dream houses profiled in Barreneche’s insightful, handsomely designed coffee-table tome are the high-style showplaces of the design-conscious rich. By contrast, Will Jones’ modest soft-cover book presents a more idiosyncratic collection, ranging from single-family residences to unbuilt concepts, prefab secondary homes to multifamily housing. Among the 40 projects featured are quirky examples like British architect Laurie Chetwood’s Butterfly House in Surrey. Fashioned from cables, wires, fiber optics and sculptural metalwork, it depicts a caterpillar’s metamorphosis. There’s also Bloembollenhof, a housing estate in the Netherlands, designed by the Dutch firm S333 as an alternative to suburban sprawl. The firm devised four simple low-rise building types with gables, dormers, and skylights that can be variously arranged to create 52 different homes, from single dwellings to townhouse blocks. 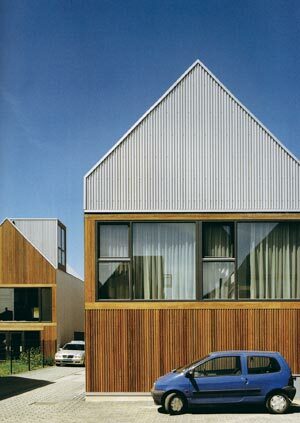 Constructed out of wood and corrugated steel, the buildings resemble farm structures. By massing them closely together, the architects have helped preserve the rural character of the surrounding landscape. pneumatic hinges prop open trap doors that open to sleeping quarters below the floors. Another perspective on the modern house is offered in Housey Housey by the Bombay-born British architect Pierre d’Avoine and his wife, architecture writer and ethnologist Clare Melhuish. Subtitled A Pattern Book of Ideal Homes, it is an assemblage of 23 housing plans, drawn from D’Avoine’s 20 years of practice and research in residential design in Britain and abroad. While appealing and contemporary, these are not showy, mega-dollar projects. They are instead highly original responses to real-world building conditions, which should make them particularly useful to most architects. Take the prefab Piper Penthouses that were lifted onto the rooftop of a converted London apartment building by crane. Or the large two-story Invisible House neatly inserted into the former back garden of a suburban London house. 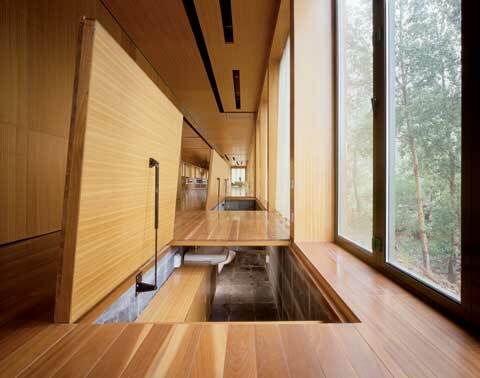 So as not to disturb the views of neighbors, one of its floors was dug into the ground. NIMBYism, it seems, exists everywhere. These three books demonstrate just how universal a language modern design has become. Let’s hope more architects the world over can teach their clients, especially developers, to speak it. Marisa Bartolucci lives in New York and writes about architecture, art, and culture. Rafael Moneo is a major figure in world architecture, at once a respected designer and an important influence in Spanish building culture. He is also an excellent teacher. His new book, Theoretical Anxieties and Architectural Strategies in the Work of Eight Contemporary Architects, is largely texts expanded from lectures given in the early- to mid-1990s at Harvard’s GSD and Madrid’s Circulo de Bellas Artes, and it keeps the livee feel of a master performance. His subject is an influential group of architects, all except one Pritzker Prize winners like himself. The result is an exacting but easy read that unfolds like a novel by Italo Calvino. In Calvino’s Invisible Cities, the explorer describes dozens of cities but at the end confesses that they evoke a single topossVenice, the city he loves above all others. Moneo describes architecture similarly. This is his own perspective, but he elaborates architecture’s nooks and crannies. But what view of architecture are we talking about here? Could Moneo’s Venicee be regional? Reading Theoretical Anxieties, I was reminded of an event in Barcelona nearly 20 years ago, where I was invited to introduce my first built project to an audience of architects. I talked about architecture and culture, film and literary criticism, establishing parallels and suggesting cross-fertilization among disciplines. At the end came outrage: No crossovers, please: Architecture is architecture, literature is literature, film is film!! To this day, the certainty of the audience puzzles me. Is architecture an absolute value that can be isolated from everything around it? 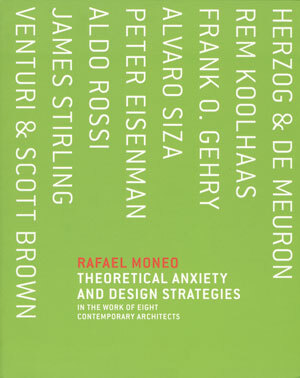 To find out more, I read further in Moneo’s book. Moneo discusses each architect in turn, beginning with an introduction that explains the architect’s intentions and concerns and then proceeding to a group of projects he considers exemplary of the designer’s oeuvre. This structure works well, and the grainy black-and-white illustrations do not detract from the rhythm of the reading. He sets the tone in the first chapter on James Stirling: This book is about the architect’s tools and forms. Stirling’s tools are the section (in his early constructivist and 19th century industrial periodd) and the plan (in his later career, influenced by Corb’s architectural promenade and Colin Rowe). Moneo characterizes Stirling’s forms as a balance of massessachieved in a quasi-canonical mannerr when discussing the Leicester Engineering Building (1959963), which celebrates the meeting of the diagonal and the perimeter.. From the outset, Moneo’s analysis is formal and compositional, at once praising the architectural landscape of the Stuttgart Staatsgalerie (1977783) and joining Rowe in lamenting its lack of facades. Stirling rarely discussed theoretical concerns, but Robert Venturi and Aldo Rossi often did. Moneo excels in his analysis of these two figures. He not only describes their intentions with precision and clarity but, having lived through the ideologies of the era, can also assume a critical distance. Moneo’s presentation of Rossi’s view of typology as the embodiment of timelessness and permanence, and of type as a basis for temporal continuity, is accurate and insightful. One of the elegant things about this book is Moneo’s way of deconstructing how architects work. Would Frank Gehry recognize himself in Moneo’s observation of Gehry’s strategy of breaking apart the program, reshaping it through an elemental impulse, and searching for the appearance of immediacy? The description tells the reader as much about architectural strategy as about Gehry. Moneo convincingly differentiates Eisenman’s and Gehry’s attitudes toward representation, noting that if the first fetishizes traditions of graphic representation, the second fetishizes the more intuitive production of models. (Moneo is scathing about Gehry here: In the final analysis, to make architecture is to know how to make a model..) Although Moneo rarely discusses construction, he does mention Gehry’s understanding of the American construction industry as well as the architect’s avoidance of simulation, which Moneo associates with Eisenman and Venturi. But the formal takes precedence over the material in Moneo’s comparison of Eisenman’s Columbus Convention Center (1989993) to Gehry’s Santa Monica Place Shopping Center (1980). Moneo never talks about the role of Los Angeles’ climate on Gehry’s early collaged materials, as opposed to the Swiss climate and its energy conservation laws on the continuous stucco surfaces he admires in Gehry’s Vitra building, which he identifies as a new direction in the master’s oeuvre. This time restriction also limits his reading of Rem Koolhaas, whom he presents as a rigid anti-contextualist, for whom place doesn’t matter.. This conclusion ignores the sophisticated dialogues that Koolhaas’ recent buildings in Seattle, Berlin, Porto, and Chicago establish with the cultures in which they are located. Moneo is better at analyzing Koolhaas’ individual projects than his overall project. For example, describing Koolhaas’ stylistic mixings as cocktail architecturee is reductive, but elucidating Rem’s flair for iconographic representations of programs, as in the Zeebrugge Ferry Terminal in Belgium (1989), makes for highly perceptive commentary. Given the writer’s astute talent at establishing comparisons and parallels among different architects, I would have been interested in seeing a link developed between Rossi’s view of type as a universal constant and Koolhaas’ obsessive efforts to invent new typologies, which are never mentioned by Moneo. Moneo’s attention to architecture as architecturee finds its culmination in lvaro Siza’s work. Perhaps because Siza’s practice echoes Moneo’s own cultural origins, it resonates throughout the book as a whole. Siza, Moneo writes, seems to want to tell us that he simply wants his architecture to reek’ of architecture. And it is this aroma of architecture”or, if you wish, of what we understand as architectureethat we breathe in his works.. What in architecture reekss of architecture? Am I not religious enough to grasp it, or am I missinggor missing out onnsome attainable absolute value? Moneo revels in the formal operations of Siza’s art, describing the Banco Pinto & Sotto Mayor (1971174) as an attempt to show architecture at its purest, devoid of phenomena and event.. Opposed to purely linguistic considerations,, it is a building that speaks of architecture and tries to offer the architectural experience in terms offits very essence: space in all purity, space without the limitations that use confines it to in buildings.. This is architecture in its most visual incarnation, an architecture of forms rather than ideas. The exclusive view expressed in Theoretical Anxieties and Architectural Strategies begs a rhetorical question: In writing about literature and writers today, could one do so without examining the role of film, television, media, social politics, or theories of public and private space? Moneo’s fundamental thesis about the arbitrary form at the very origin of our workk restricts architecture’s terrain, leaving out issues of context and content. Yet within these preconceptions, few writers have addressed the territory with equal incisiveness or authoritative command. Hence the second question raised by this volume: How can an architect write well about his colleagues? Here Moneo’s sharp insights and thorough research make for remarkable reading. But if there is a moment when Moneo’s discerning commentary becomes outstanding, it is when he makes cross-comparisons among architects, establishing similarities, relations, and differences. It is at this point that Moneo is most potent and, to my mind, really talks about architectureewhich exists at the intersection of vastly different practicessby using these well-informed differences and adding information drawn from first-hand knowledge of the architects, their work, and his own. At this point Moneo moves beyond the common denominator of form to touch on the rich complexity of what architecture is. In the sense that architecture is between the lines, you have to read between the lines of this book. Bernard Tschumi is an architect in New York and Paris. The AIA Guide to New York by Elliot Wallinsky and Norval White was first published in 1967, but it remains the architecture guidebook to New York City against which all others must be measured. It is still the most comprehensive source on the city’s architecture, primarily because it is one of the few to thoroughly survey all five boroughs, and includes more than 130 maps and 3,000 building images. Originally long and lean, it has gotten chunkier with each new edition. Its one drawback is that it is too bulky to be carried easily on walks. Also, it has not been revised since 2000 which means, for a city like New York, it’s sure to have significant omissions. A quick glance at the New York section of Urban Center Books makes it clear that many authors have tried to round out the picture. In the armchair traveler category, the most satisfying new book is The Landmarks of New York by Barbaralee Diamonstein-Spielvogel, a leading landmarks advocate and former member of the New York City Landmarks Preservation Commission. The book is billed as the definitive history and guide to New York’s most treasured structures,, although Robert A. M. Stern’s three volumes on New York, published by Rizzoli, might also lay claim to this title. Landmarks of New York is a history of preservation in the city, and begins in 1831, when New Yorkers began to first fret that important buildings were being lost, and continues through the destruction of the World Trade Center. Along with every official landmarked building in the city, Diamonstein-Spielvogel includes many lesser-known but interesting examples, like the four Hunterfly Road Houses on Bergen Street in Brooklyn that were the center of an early black community in the 1830s. Part of the same pocket-sized series is Nancy Berner and Susan Lowry’s comprehensive Garden Guide: New York City. It features many little-known publicly accessible green spaces, such as the Lotus garden on the roof of a garage on West 91st Street, and community gardens like the Taqwa Community Farm and the Garden of Happiness, both in the Bronx. The slim paperback Touring Gotham’s Archaeological Past: 8 Self-Guided Walking Tours Through New York City is a guide to the city not only of today but of yesterday. It discusses Native American life here, the early development of the grid, and long-gone neighborhoods. It includes drawings of a 16th-century Dutch West India wind-powered sawmill and maps of the Lower Manhattan waterfront when it bumped up against Hanover Square. In a city that seems to change by the moment and quickly obscures its past, it is a pleasure to know what’s under our feet as well as on the street. Another often-overlooked feature of New York is its public art. City Art: New York’s Percent for Art Program features the nearly 200 works of public art completed since the program’s 1983 initiation. While many of these pieces are easily accessible, others are in obscure spots. With an introduction by New Yorker critic Adam Gopnik and an essay by art critic Eleanor Heartney, the book documents the work of several of the city’s best known public artists and their experiences working for the city. 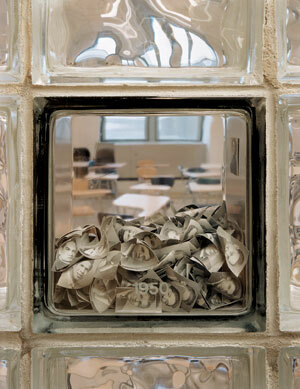 Kristen Jones and Andrew Ginzel’s 1992 installation, Mnemonics, at Stuyvesant High School, featured in City Art. These books are but a sampling of the range of New York City guidebooks, each with a strong point of view. While they contain many familiar landmarks and spaces, they also offer just enough that is new (or little-known) to allow you to see the city with the wide-open eyes of a tourist. William Menking is an editor at AN. It’s no secret that architects and designers are fantastic fetishists. Sensuous forms, hard details, or soft textures can be enough to arouse even the most mild-mannered among us. The greatest turn-on of all, though, might just be the monographhthose beautiful tomes that we love to possess, exhibit, and gaze at. Here are several recent publications that we found not only eye-popping but stimulating too.